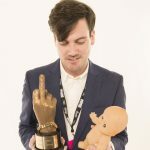 George Ergatoudis, head of BBC Radio 1, has spoken about the station’s failure to playlist recent tracks by La Roux – and answered a question from Brandon Flowers about whether he’s now too old make the cut. In July, a report in The Sun claimed that La Roux’s Elly Jackson, aged 26, had been “deemed ‘elderly'” for the station and “shunted off to Radio 2”. Speaking in the new issue of NME, which is on newsstands now and available digitally, Ergatoudis said it was “a really difficult one” deciding whether to playlist singles from La Roux’s comeback album ‘Trouble In Paradise’. Ergatoudis is quizzed by a host of readers and musicians in the issue. One of them, Killers frontman Brandon Flowers, asked if he is too old to make the playlist at age 33. For the full interview with George Ergatoudis, check out the Christmas double-issue of NME.